Medical robotics firm Myomo has secured CE mark for commercial sale of its MyoPro myoelectric arm orthosis throughout the European Economic Area (EEA). A lightweight wearable device, MyoPro can help restore function in the paralyzed or weakened arms and hands of people who had a stroke, nerve or spinal cord injury, or other neuromuscular disability. 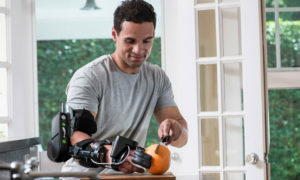 It has been designed to help the individuals, especially for those who struggle with upper limb paralysis to carry out their daily chores like feeding themselves, lifting objects alongside other household tasks. Myomo has manufactured MyoPro in three variants to suit the specific needs of paralyzed patients. Launched in June, MyoPro orthosis extends the capabilities of its predecessor, stated Myomo. Using the powered orthosis, many paralyzed individuals are also able to return to work as per Myomo. The MyoPro powered brace provides support to the impaired hand and arm, to help it move again. Individuals wearing the brace use their own muscle signals to regulate movements of the paralyzed or weakened arm. According to Myomo, the precision sensors in the MyoPro powered brace detect the weak muscle signals whenever the user attempts to bend the affected arm or open or close the hand. Following this, the sensors activate the motors in the brace to help mobilize the hand and arm the way the user wants to. Myomo chairman and CEO Paul R. Gudonis said that the company is working with its partner Ottobock to plan for a European launch for the MyoPro myoelectric arm orthosis, starting from Germany. Gudonis added: “Myomo recently conducted sales and clinical training for Ottobock staff, which has begun evaluating patients for the MyoPro device. Image: A paralyzed individual carrying out a household task with the MyoPro myoelectric arm brace. Photo: courtesy of Myomo, Inc.